A stressful job and long working hours could see you spending long hours in your office, mainly glued to your computer or discussing plans with your colleagues. But that should not be your reason to be not active and engage in some form of exercise. No matter how busy you are, you can and you must take some time out for some type of physical activity. However, just planning a workout regime is not enough. It is important that you stick to it and maintain an active lifestyle. Here are three interesting ways in which you can ensure that you don’t stay inactive for too long. Sweating it out in the gym for two to three hours every day is not the only way to stay fit. Health and fitness experts believe that it is not how long you exercise but how you do it that makes all the difference. Instead of concentrating on the time, try exercises that are most beneficial to your body. 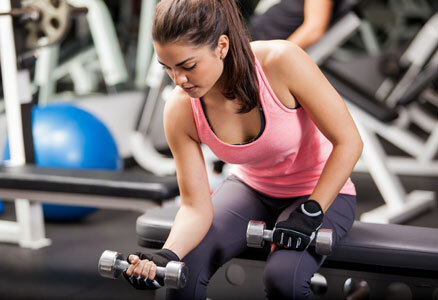 Consult a fitness expert to plan an exercise regimen that suits your body and lifestyle. In case you cannot devote a single lengthy session, an expert can break up the exercise routine into smaller sessions spread out over the course of your day. This way you can take care of your work and still stay active. There is no hard and fast rule that you should go to the gym for staying active. You can always get a few pieces of equipment installed in your home or office. With some professional help, you can find the best equipment that would help you stay active. Despite your busy schedule, take brief breaks and work out for some time. It would not only give you a breather from your work but also keep your mind and body active. In case you are unable to install them at work or have no spare room at home, make a few changes in your habits. Climbing stairs and walking to work is a great way to stay active. Keep a look out for aerobics or yoga clubs in your neighbourhood. Many locals have regular sessions in a neighbourhood park or building for residents, often led by reputed professionals. You can always join a club and continue at home after you learn the exercises. If you regularly fail to find some time to exercise in your daily routine, it may be essential to plan ahead. Starting on a fitness regimen is difficult at first, but once you start doing it regularly, it becomes a way of life. Allocating a time slot for taking care of your health should be a no-brainer, but not all of us attach the same level of importance to something unless it is formally laid out in our daily planner. Just like you schedule your meetings and appointments, schedule a slot for your fitness routine as well. This can help you get started on your path to better health and fitness. Once you start exercising regularly, it may still be important to allocate some time to avoid falling out of habit. Do not let the pressure of a busy work schedule get in the way of your health. Exercise is even more important if you find yourself increasingly busy. Follow these easy and time-tested steps to find time for regular exercise. Staying active is extremely important for your physical as well as mental health, and you should never neglect it.